This plan is designed to set a regularly scheduled maintenance service to fit your needs. We will assist you in setting the proper service intervals for your truck. This program includes oil and filter change, lubrication, and tire rotation, along with an 82-Point Preventative Maintenance Inspection. We then advise you of any necessary repairs that your vehicle requires currently and in the near future. The advantage of this program is to ensure that your vehicles are constantly maintained properly to keep them in top running condition. We are open Mon, Tue, Thu, and Fri from 8:30 AM-6:00 PM, and Wed 8:30 AM-8:00 PM. We can service your vehicles when it is most convenient for you. We offer a free shuttle service and free loaner cars to our customers, as well as convenient, free vehicle pick-up and delivery. With this service, you won’t be delayed while waiting for your vehicles to be serviced or repaired, because we know how important your vehicles are to the productivity and success of your operation. With that in mind, we will give your vehicles priority scheduling to ensure that your maintenance and repairs are completed as quickly as possible. We are Light/medium Duty Diesel Engine repair experts. Our diesel technicians are trained on all diesel engines including: Ford/Navistar 7.3 / 6.0 Powerstroke, GM 6.5 Turbo Diesel / 6.6 Duramax, 5.9 Cummins, Mack, Caterpillar, Isuzu, U/D, Mitsubishi and Sprinter / Mercedes. We offer turbocharger, inter-cooler fuel injector and injector pump diagnosis, repair and replacement. We also perform diesel and gas performance upgrades. We offer a full line of services including pre-trip inspections, generator service and repair, air suspensions, transmission service and rebuilding. We are also a Bank Service Center and can install Power Packs and Stringer Kits. Our service includes but is not limited to Motor Homes, School Buses A, B, and C class chassises. Hunter Thrust Angle & 4 Wheel Alignments – The new Hunter R811-19 Alignment Machine features a patented bar graph that shows the amount and direction of adjustment required to correct your vehicle’s alignment. …is a revolutionary process that will clean your vehicle’s fuel system, including injectors and remove harmful carbon deposits. This system utilizes unique cleaning solution, which will not damage your vehicle’s sophisticated engine components. After MotorVac Carbon Cleaning System cleans your engine, you will notice improved performance, acceleration and increased fuel economy. Typical transmission service only replaces 25% of contaminated fluid leaving behind 75% contaminated fluid mixed with the new transmission fluid. Our Transmission Fluid Flush Machine safely removes 100% of contaminated fluid, varnishes and sludge deposits and cleans all internal transmission components. 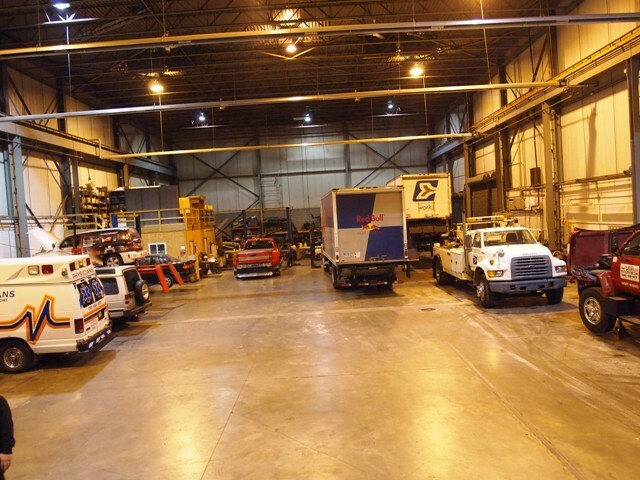 We are a certified Meyer and Western snowplow dealer, repair and maintenance facility. Our certified plow technicians can install, maintain and repair all brands of snowplows, including your central hydraulic systems and salt spreaders. We have a great fabricating shop equipped with mig, tig and arc welders. Our fabricating specialists can handle all of your welding, cutting and fabricating needs. Suburban Car and Truck Repair is your one-stop shop for all your fleet vehicles: cars or light, medium, and heavy-duty trucks, up to Class A. Call Paul, Bob, or Tim at 216-662-2102 and make an appointment today!